It's time to vamp up the brokerage industry. With our first partnership with Hodl Hodl, a peer-to-peer bitcoin exchange, we're exploring the boundaries of the technology that will revolutionize finance as we know it. Today we are proud to announce our partnership with premier Bitcoin liquidity provider “L2B Global” — a company that mainly operates in North America and Europe, which will help us increase both liquidity and the number of trusted traders at Hodl Hodl. This partnership means a lot to us, because it is perfectly in line with our vision for the future of the bitcoin OTC market: a transition from the legacy infrastructure to technology-based solutions. From a horse carriage to a Tesla in a single upgrade! Hodl Hodl is a peer-to-peer bitcoin OTC marketplace that allows individuals and companies to buy and sell bitcoin without intermediaries. While peer-to-peer markets are not new, Hodl Hodl’s approach is quite novel: by leveraging the power of multisignature wallet capabilities native to Bitcoin, they provide a trading environment in which settlement is virtually guaranteed. The company itself is involved but in a rare case of dispute, playing the role of an arbitrator. Besides that, all interactions, such as rate negotiation, payment details and delivery, happen between the trading parties. We recommend that you visit Hodl Hodl’s FAQ section to learn more about how to trade on their platform. As a brokerage house, we are quite flexible in terms of operations. Clients, who already have their trust in us, prefer to deal with L2B Global directly: they send us their funds upfront, our team executes the trade and settles with them. This is the most straightforward way of buying or selling bitcoins. However, we completely understand the need for assurance and protection of funds required by those unfamiliar with us. 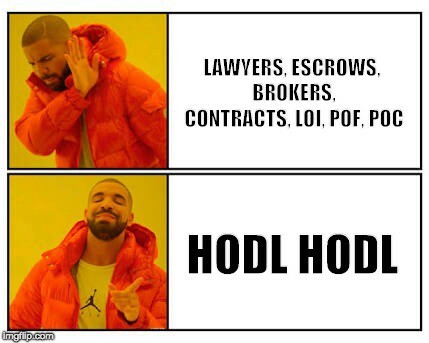 Hodl Hodl helps our clients achieve a sense of security with no pre-existing relationship or trust. Provided that the buyer has sent the funds to the seller, they are sure to receive their bitcoins, locked in the multisig contract in advance and for the duration of the deal. Where we truly act as an intermediary is our match-making Agency service for buyers and sellers. While we are considered a “third party” because we connect the two, the deal itself happens in a peer-to-peer manner without our participation. Because large deals are not always advertised in public order books for privacy reasons, Hodl Hodl’s private deals allow us to connect high-volume clients with each other without the whole world knowing about it. Thanks to the way the platform works, the deal details cannot be modifiedafter the contract has been initiated. This means that we will not be able to replace our buyer’s bitcoin address with ours or our seller’s banking details with our own bank account. The funds will be exchanged as intended! If the client wants full control, we are happy to walk them through every step of the deal, from registering on hodlhodl.com to creating an order and executing it! Utilizing Hodl Hodl’s multisig contract solution is the first step towards our push for transformation in the OTC industry. Other teams across the globe work tirelessly to develop new hardware and software that will change the way we do business and reshape the domain. Instant fiat and bitcoin inter-exchange and inter-brokerage settlements, confidential transactions, increased liquidity, new arbitrage opportunities and other breakthroughs are here, and L2B Global is happy to be among the pioneers adopting these new technologies.